DEARBORN, Mich., June 21, 2017 – Ford has donated the world’s only “life-size” Hot Wheels® Transit Connect to the Darrell Gwynn Quality of Life Chapter of The Buoniconti Fund to Cure Paralysis, which the charity will sell during the 2nd Annual Barrett-Jackson Northeast Auction, June 21-24, 2017 at Mohegan Sun in Connecticut.In addition to the charity sale, Ford will offer thrill rides with a professional driver and exhibit its latest vehicles including the new 2018 Mustang. A highlight of the weekend will be the auction of the custom Ford van on Saturday evening, June 24. 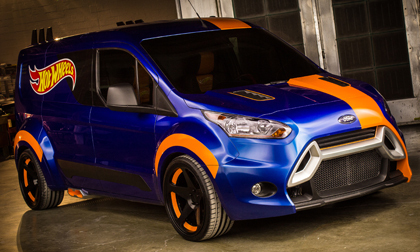 The 2014 Ford Transit Connect in Hot Wheels livery was revealed at the 2013 SEMA show. It features an entirely custom, euro-look wide body kit, Rotiform ROC wheels, sleeping quarters and tool storage with slide-out drawers for Hot Wheels cars. Michigan-based custom builder Ice 9 Group worked with Ford and Hot Wheels designers to create a one-of-a-kind dream machine. Using computer-aided drafting and tooling, they crafted an entirely new look. Every single aspect of the exterior is different, including the roof. Powered by a 2.5-liter engine, the Hot Wheels Transit Connect was widened 4 inches in front and 6 inches at the rear. It features functional custom exhaust, gullwing doors, new front fascia and bumpers inspired by the Focus RS Mk2 and custom 20-inch wheels. The interior was customized with a secondary floor installed covering the tool storage, a 55-inch TV screen, two 18-inch tablets in the rear doors and Recaro® seats. Two Hot Wheels orange tracks are recessed in the bed, forming a drag strip right down the center of the van. Mattel also offered a 1:64 scale model of the custom vehicle through retailers worldwide. To support the sale of this charity vehicle, Mattel will invite the winning bidder to personally tour their Southern California studio and meet the designer team who create Hot Wheels vehicles (transportation not included). Mattel is a creations company that inspires the wonder of childhood. Our mission is to be the recognized leader in play, learning and development worldwide. Mattel’s portfolio of global consumer brands includes American Girl®, Barbie®, Fisher-Price®, Hot Wheels®, Monster High® and Thomas & Friends™, among many others. Mattel also creates a wealth of lines and products made in collaboration with leading entertainment and technology companies. With a global workforce of approximately 32,000 people, Mattel operates in 40 countries and territories and sells products in more than 150 nations. Visit us online at www.mattel.com. Ford Motor Company is a global automotive and mobility company based in Dearborn, Michigan. With about 201,000 employees and 62 plants worldwide, the company’s core business includes designing, manufacturing, marketing and servicing a full line of Ford cars, trucks and SUVs, as well as Lincoln luxury vehicles. To expand its business model, Ford is aggressively pursuing emerging opportunities with investments in electrification, autonomy and mobility. Ford provides financial services through Ford Motor Credit Company. For more information regarding Ford and its products and services, please visit www.corporate.ford.com.